I know most of you probably would have heard of the beauty blender and its magical powers. Incase you haven't, you're about to. If I pour out my feelings about this product, i'm pretty sure I'd become the next Shakespeare. But let me just leave him with his fame. I don't want to compete hehehehe. You know those beautiful makeup photos you see and you just wish you could get a flawless foundation look just like them? Well, this is the not-so-secret weapon. It comes in 3 different colours (pink, black and white) and you can buy the singular or the double one. The packaging is beautiful! as you can see from the picture above. It's so attractive. It also comes with instructions on how to use it so you don't buy it and keep wondering how it is used. It gives you this perfect finish with a flawless look. The suede texture feels good on the skin but not so soft. It's designed in a way that the curves would fit the face contours and those hard to reach areas of the face. It is true to its claims and description. In my opinion, it is the perfect blending tool. 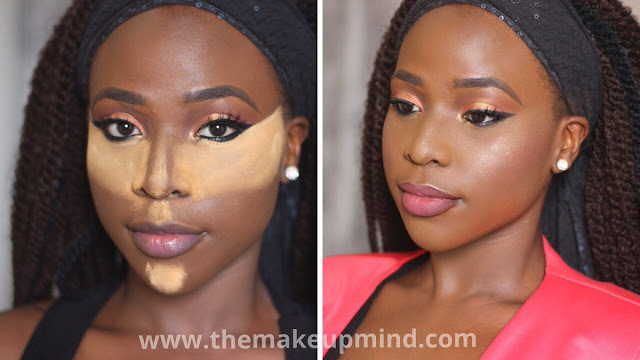 It can be used to apply liquid products like foundation and concealer to the face so, it's not just a blending tool but it's also an application tool. Another cool thing is that it can be used when doing nail art to create a beautiful ombré effect and of course, blend the colours together. This is a must have for nail artists. It's really easy to use in just 3 steps. Wet the sponge, squeeze the sponge and bounce it all over your face! When it gets wet, it automatically becomes twice its size! I love magic shows so this definitely gets me wide eyed like O_O. Lol. The sponge after getting wet and squeezed becomes twice its normal size! Compare it to the other one on the right. In my opinion, every girl needs a beauty blender in her makeup kit! Please share this post so that your friends can benefit from it too!